This article is about the Italian island. For the island's main town, see Capri, Campania. For other uses, see Capri (disambiguation). Not to be confused with Carpi, a town in northern Italy. Capri (usually pronounced /kəˈpriː/ by English speakers; Italian: [ˈkaːpri], Neapolitan: [ˈkɑːpri]) is an island located in the Tyrrhenian Sea off the Sorrentine Peninsula, on the south side of the Gulf of Naples in the Campania region of Italy. The main town Capri that is located on the island shares the name. It has been a resort since the time of the Roman Republic. Some of the main features of the island include the Marina Piccola (the little harbour), the Belvedere of Tragara (a high panoramic promenade lined with villas), the limestone crags called sea stacks that project above the sea (the faraglioni), the town of Anacapri, the Blue Grotto (Grotta Azzurra),the ruins of the Imperial Roman villas, and the various towns surrounding the Island of Capri including Positano, Amalfi, Ravello, Sorrento, Nerano, and Naples. Capri is part of the region of Campania, Metropolitan City of Naples. The town of Capri is a comune and the island's main population centre. The island has two harbours, Marina Piccola and Marina Grande (the main port of the island). 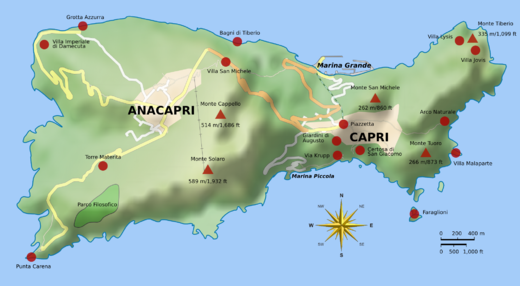 The separate comune of Anacapri is located high on the hills to the west. The etymology of the name Capri is unclear; it might either be traced back to the Ancient Greeks (Ancient Greek κάπρος kapros meaning "wild boar"), the first recorded colonists to populate the island. But it could also derive from Latin capreae (goats). Fossils of wild boars have been discovered, lending credence to the "kapros" etymology; on the other hand, the Romans called Capri "goat island". Finally, there is also the possibility that the name derives from an Etruscan word for "rocky", though any historical Etruscan rule of the island is disputed. Capri is a large, limestone and sandstone rock. The sides of the island are perpendicular cliffs and the surface of the island is composed of more cliffs. The voters of the island elect representatives for the two municipalities (comuni) on the island. The chosen representatives then choose two mayors to govern with them. The island has been inhabited since early times. Evidence of human settlement was discovered during the Roman era; according to Suetonius, when the foundations for the villa of Augustus were being excavated, giant bones and 'weapons of stone' were discovered. The emperor ordered these to be displayed in the garden of his main residence, the Sea Palace. Modern excavations have shown that human presence on the island can be dated to the Neolithic and the Bronze Age. Augustus developed Capri; he built temples, villas, aqueducts, and planted gardens so he could enjoy his private paradise. In his Aeneid, Virgil states that the island had been populated by the Greek people of Teleboi, coming from the Ionian Islands. Strabo says that "in ancient times in Capri there were two towns, later reduced to one." 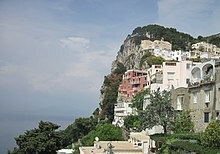 Tacitus records that there were twelve Imperial villas in Capri. Ruins of one at Tragara could still be seen in the 19th century. Augustus' successor Tiberius built a series of villas at Capri, the most famous of which is the Villa Jovis, one of the best-preserved Roman villas in Italy. In 27 AD, Tiberius permanently moved to Capri, running the Empire from there until his death in 37 AD. In 182 AD, Emperor Commodus banished his sister Lucilla to Capri. She was executed shortly afterwards. After the end of the Western Roman Empire, Capri returned to the status of a dominion of Naples, and suffered various attacks and ravages by pirates. In 866 Emperor Louis II gave the island to Amalfi. In 987 Pope John XV consecrated the first bishop of Capri, when Capri, Scala, Minori, and Lettere were made dioceses to serve as suffragans of Amalfi, which thereby became a metropolitan see. Capri continued to be a residential diocese until 1818, when the island became part of the archdiocese of Sorrento. 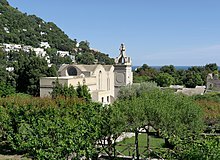 No longer a residential bishopric, Capri, Capreae in Latin, is today listed by the Catholic Church as a titular see. In 1496, Frederick IV of Naples established legal and administrative parity between the settlements of Capri and Anacapri. The pirate raids reached their peak during the reign of Charles V: the famous Turkish admirals Barbarossa Hayreddin Pasha and Turgut Reis captured the island for the Ottoman Empire, in 1535 and 1553 respectively. The first recorded tourist to visit the island was French antiques dealer Jean-Jacques Bouchard in the 17th century. His diary, found in 1850, is an important information source about Capri. French troops under Napoleon occupied Capri in January 1806. The British ousted the French in the following May, after which Capri was turned into a powerful naval base (a "Second Gibraltar"), but the building program caused heavy damage to the archaeological sites. The French reconquered Capri in 1808, and remained there until the end of the Napoleonic era (1815), when Capri was returned to the Bourbon ruling house of Naples. The natural scientist Ignazio Cerio catalogued Capri's flora and fauna during the 19th century. His work was continued by his son, author and engineer Edwin Cerio, who wrote several books on life in Capri in the 20th century. Prior to the First World War the island was extremely popular with wealthy gay men. John Ellingham Brooks and Somerset Maugham shared a villa there. Norman Douglas, Friedrich Alfred Krupp, Jacques d'Adelswärd-Fersen, Christian Wilhelm Allers, Emil von Behring, Curzio Malaparte, Axel Munthe, and Maxim Gorky are all reported to have owned a villa there, or to have stayed there for more than three months. Swedish Queen Victoria often stayed there because Axel Munthe was her doctor. Rose O'Neill, the American illustrator and creator of the Kewpie, owned the Villa Narcissus, formerly owned by the famous Beaux-Arts painter Charles Caryl Coleman. Dame Gracie Fields also had a villa and restaurant on the island and is buried there. Mariah Carey owns a villa on the island. In 1908, Lenin was hosted by Maxim Gorky, the Russian author, at his house near the Giardini Augusto. In 1970, a monument by Giacomo Manzù was erected during the centennial celebration in Lenin's honour. Today, Capri has become more of a resort and is visited by tourists during the summer months of July and August. During the later half of the 19th century, Capri became a popular resort for European artists, writers and other celebrities. The book that spawned the 19th century fascination with Capri in France, Germany, and England was Entdeckung der blauen Grotte auf der Insel Capri (Discovery of the Blue Grotto on the Isle of Capri) by the German painter and writer August Kopisch, in which he describes his 1826 stay on the island and his (re)discovery of the Blue Grotto. John Singer Sargent and Frank Hyde are among the prominent artists who stayed on the island around the late 1870s. Sargent is known for his series of portraits featuring local model Rosina Ferrara. The English artist and adventurer, John Wood Shortridge, acquired a fortino at Marina Piccola in the 1880s, (later transformed into a private villa by Dame Gracie Fields) and married a Capri girl, Carmela Esposito. He formed a close friendship with the English novelist George Gissing who provides a colourful and insightful account of his stays with Shortridge in his Published Letters of George Gissing. In the Gissing Journal, vol. XXXV, no. 3 (July, 1999), p. 2. it is recorded that the only mention of him in a recent book, albeit partially inaccurate, occurs in James Money's Capri: Island of Pleasure (London: Hamish Hamilton, 1986, p. 42). Claude Debussy refers to the island's hills in the title of his impressionistic prélude Les collines d'Anacapri (1910). Capri is the setting for "The Lotus Eater" (1945), a short story by Somerset Maugham. In the story, the protagonist from Hendon, part of the borough of Barnet in London, comes to Capri on a holiday and is so enchanted by the place he gives up his job and decides to spend the rest of his life in leisure there. British novelist Compton Mackenzie lived there from 1913 to 1920, with later visits, and set some of his work on the island (e.g. Vestal Fire, 1927). As well as being a haven for writers and artists, Capri served as a relatively safe place for foreign gay men and lesbians to lead a more open life; a small nucleus of them were attracted to live there, overlapping to some extent with the creative types mentioned above. Poet August von Platen-Hallermünde was one of the first. Jacques d'Adelswärd-Fersen wrote the roman à clef Et le feu s’éteignit sur la mer (1910) about Capri and its residents in the early 20th century, causing a minor scandal. Fersen's life on Capri became the subject of Roger Peyrefitte's fictionalised biography, L'Exilé de Capri. A satirical presentation of the island's lesbian colony is made in Mackenzie's 1928 novel Extraordinary Women (unrelated to the Dominican film of the same name), inspired by the affairs of American painter Romaine Brooks (in the novel, under the pseudonym of Olimpia Leigh). One of the island's most famous foreign gay exiles was Norman Douglas; his novel South Wind (1917) is a thinly fictionalised description of Capri's residents and visitors, and a number of his other works, both books and pamphlets, deal with the island, including Capri (1930) and his last work, A Footnote on Capri (1952). Memoirs set on Capri include Edwin Cerio's Aria di Capri (1928) (translated as That Capri Air), which contains a number of historical and biographical essays on the island, including a tribute to Norman Douglas; The Story of San Michele (1929) by Swedish royal physician Axel Munthe (1857–1949), who built a villa of that name and Shirley Hazzard's Greene on Capri: A Memoir (2000), about her reminiscences of Graham Greene. Graham Greene had a house in the town of Anacapri, the upper portion of the island, where he lived with his lover Catherine Walston. The Last Legion, a historical fantasy novel by Valerio Massimo Manfredi, is partly set on the island of Capri, where Romulus is imprisoned after a failed rescue attempt in Ravenna by Aurelianus. Romulus discovers the sword of Julius Caesar hidden in one of Tiberius's villas, which is revealed at the end of the novel to be the legendary sword Excalibur. Parts of the 2007 film adaptation were subsequently filmed on the island. French singer Hervé Vilard scored a 1965 international success with the song "Capri c'est fini". Capri is a tourist destination for both Italians and foreigners. In the 1950s Capri became a popular resort. In summer, the island is heavily visited by tourists, especially by day trippers from Naples and Sorrento. Many of these visitors make it a point to wear the Capri pants named after the destination. The center of Capri is the Piazza Umberto I.
Capri is home to the Mediterranean bush, the Arboreal Euphorbia, and the Ilex Wood. The native fauna on the island include quails, robins, peregrine falcons, woodcocks, blackbirds, geckos, red goldfish, conger eels, sargos, groupers, mullets, and the blue lizard of the Faraglioni. Capri has twelve churches, seven museums and several monuments. 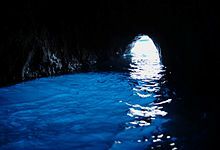 The most visited attraction in Capri is the Grotta Azzurra (Blue Grotto), a cave discovered in the 19th century by foreign tourists. On one side of the grotto are the remains of ancient Roman rock, with a narrow cavern. Capri is served by ferry or hydrofoil from Naples, Sorrento, Positano and Amalfi as well as by boat services from the ports of the Bay of Naples and the Sorrentine Peninsula. Boats arrive in the morning and leave after lunch (3–4 pm). Naples is served by two ports, Mergellina and Molo Beverello. Molo Beverello has a higher frequency of departures and a larger selection of boats than Mergellina. From Naples, the ferry takes 80 minutes, and the hydrofoil 40 minutes. From Sorrento, the ferry takes about 40 minutes while the hydrofoil takes about 20 minutes. Boats call Marina Grande, from where the Capri funicular goes up to Capri town. From Anacapri, a chair lift takes passengers to Monte Solaro, the highest point on the island. There is also a bus service that connects the centre of Capri town with Marina Grande, Marina Piccola, Anacapri and other points. ^ a b c Gellhorn, Martha. "Everybody's Happy on Capri". Saturday Evening Post. ^ a b Fiori, Pamela. "Italy's Pleasure Island Capri". Town & Country. ^ Swallow, Nicky. Amalfi Coast with Naples, Capri & Pompeii. Hoboken: John Wiley & Sons Inc. p. 265. ^ "Capri Island APP, Personalities, Romaine Brooks". Archived from the original on 2012-01-13. ^ Hazzard, Shirley (2000). Greene on Capri. New York: Farrar, Straus and Giroux. p. 4. ^ "Capri Art 2011 – Festival della diversità". Capriartfilmfestival.com. 29 April 2011. Retrieved 2 June 2011. ^ a b c "Capri Tourism". Capri Tourism. Retrieved 2 June 2011. ^ a b Netplan srl – Servizi Internet per il Turismo – http://www.netplan.it. "Capri attractions – Capri events – Capri Film Festival – Capri concerts – Capri festivals – Capri – entertainments in Capri – Italy". Travelplan.it. Retrieved 2 June 2011. ^ Swallow, Nicky (2012). Amalfi Coast with Naples, Capri & Pompeii. Hoboken: John Wiley & Sons Inc.
Wikimedia Commons has media related to Capri (island). Wikivoyage has a travel guide for Capri. Wikisource has the text of the 1911 Encyclopædia Britannica article Capri. Capri Insider Tips — by the locals.